It's a beautiful sunny day in Inso's World today... even if it is quite chilly. The last fortnight has pretty much been all about work, lack of sleep and a little bit of hobby here and there... but as of yesterday, I am not only on a week off work but have also acquired a head-cold so this post is going to be a bit random. If you look at the image, I have shown the four possible poses that can be achieved, without having to alter any components. 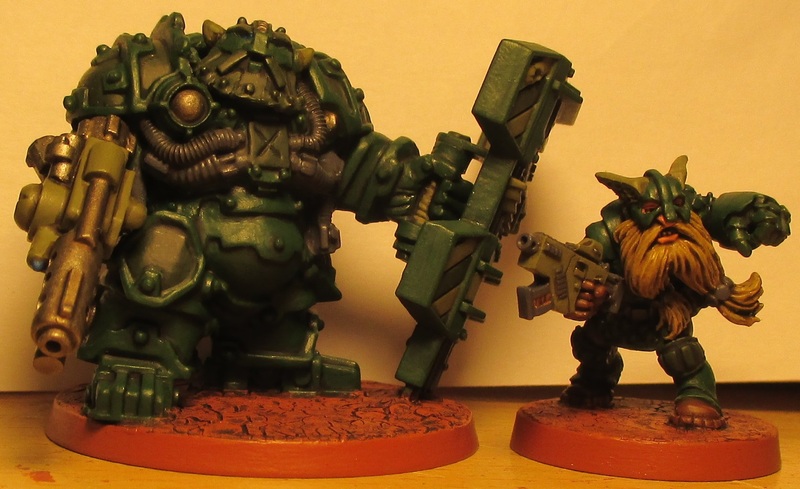 I am pleased with how they turned out and it opens up the possibility of getting another six, in the future, and turning them into heavy weapon variants... who knows? So far, I have cleaned up two bodies and glued heads on them so I don't have much to take a pic of... but hopefully, there will be more to share soon. 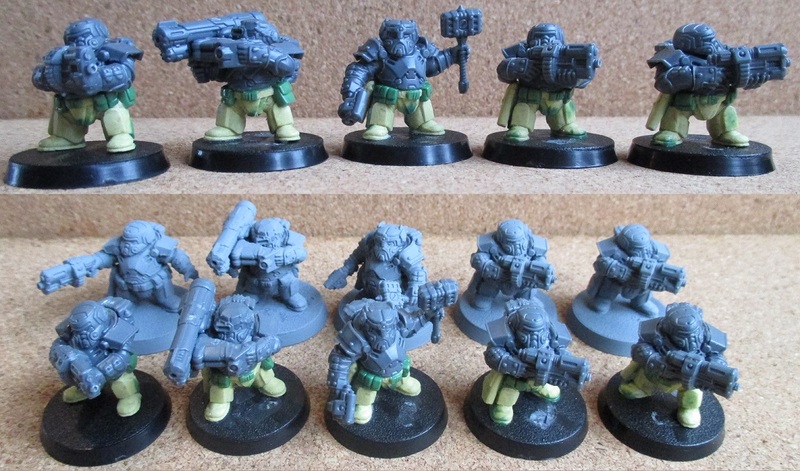 I am thinking that they would make a good Kill Team or Necromunda gang... and with the addition of a couple of random Halflings from HERE (I have them on the bench as well), there will be a good representation of the Abhuman races from the games. Well... that's about it for now. I'm sure that I'll think of something to write about by the time I write the next post. See you through bleary eyes! This week has been pretty much the same as most others. I have been working hard, getting a few charity bits and bobs sorted, doing the odd chore and getting some hobby time in as well. At work, I am starting to feel like I have properly settled in and am relaxing a bit. My work-mates are including me in more conversation and have realised that I am in for the long haul. I still think that I have found my calling and am really happy to have been given the opportunity to work alongside some wonderful people in such a challenging, yet hugely rewarding, career. It is most certainly a 'job' that has got me smiling more than any other job ever has. That said, I think that the timing was important... I could not have worked in Dementia Care five years ago. I don't think I could have coped because I was less patient and quick to get annoyed. Now, I am being praised for my calmness and patience! Now I just have to finish the five special ones (meltas, comms and Sgt). 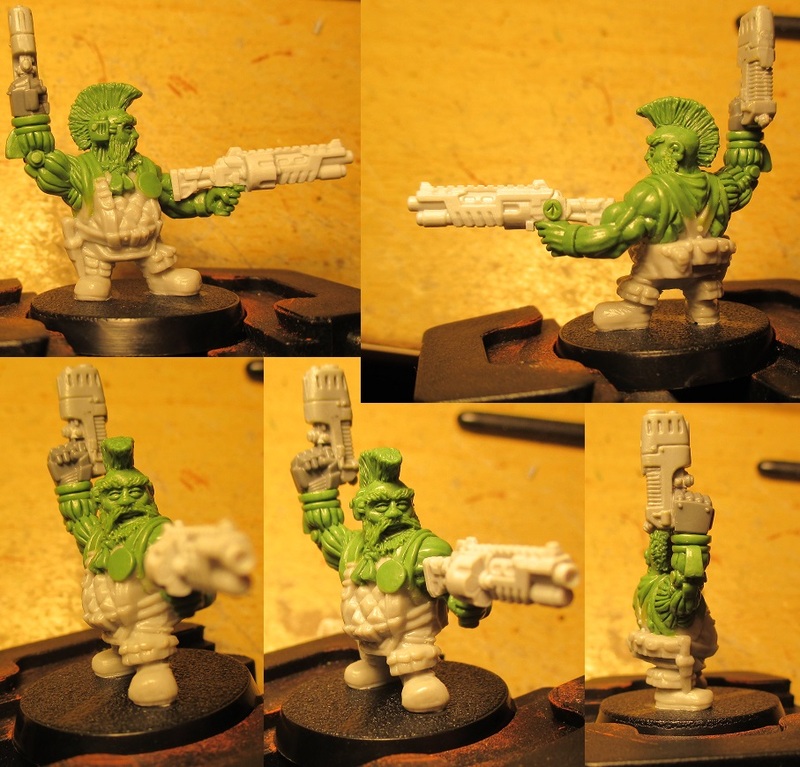 Since the picture was taken, I have reworked the pointing arm of one of the troopers; it was too short so I had to pull it off and sculpt in an extra segment. As for the rest of them, I will sculpt the hands/sleeves on the four troopers first because the Sgt will need a bit of extra work due to his bionic arm (he has a cuff mounted chainsword and I am also planning to attach a spare hand to his belt so that he can swap out his chainsword when he needs to). I think it is perfect for the Centurion role that I have chosen it for. It is 50mm tall from the bottom of the base to the top of its carapace. As for the conversion, I had all sorts of plans but decided that less is more so I have gone for the simple option of replacing the head with a bubble windscreen. There is ample room inside for a Squat pilot so that is good. I have also decided to use the thumbs from the kit and move the meltas to the back of each fist (they fitted to the thumb position but didn't look right to me)... no trimming required just a case of gluing them in a different location. 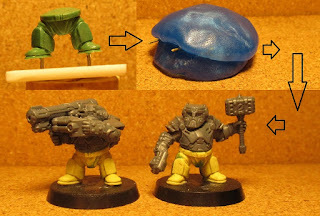 I will also be adding the 'shoulder shield' to the top of the carapace so that it can represent an assault launcher (as per the Centurion rules). On to the kit. The kit is a nice one. It has the options of fitting a thumb, graviton gun or meltagun to each hand, in the thumb position. Each sprue contains all the components required to make the robot in two poses... and as a result there is an extra set of legs/abdomen, and extra head and an extra shoulder joint. I am very happy that there are extra legs because they will make great conversion fodder and I am already thinking of upgrading one of my planned Minotaur 'Ogryn' with some mechanical legs. 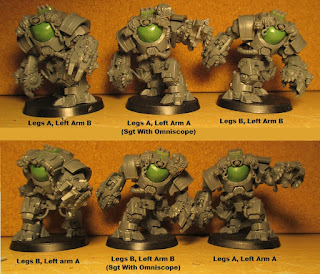 The kit assembles simply but the upper armour on the thighs, needs some careful positioning or it will look odd. I am very happy with my purchase and, to be honest, I don't think that they are too badly priced either. On to a bit of life and I am currently under the influence of pain-killers due to my shoulder being horrible today. That means that it's going to be a day off from pretty much everything so the hobby has taken a hit. I also apologise if this post doesn't make sense. See you through the haze! So. 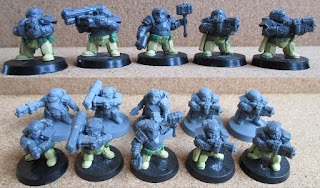 This week has mostly been about work, a few chores and a bit of hobby. My wife has finally got to a point where she is well enough to go to work and go out and about, as long as she takes it steady... so we have been shopping and out for a meal as well as having an evening at the pub so things are starting to get back to normal after her little illness (7 weeks isn't little...). Work has been good. I had my probation interview and they are keeping me on... so that is good news. I read through the official background for him and took certain aspects as inspiration. I decided to give him a Berserker's Mohawk because his character is a bit of an anarchist and I thought a Mohawk would show this. I didn't go too mad with bionics apart from his arm because I felt that his flak armour could be covering all sorts of cybernetic gubbins and I didn't feel it was necessary to go overboard on the bits you can see. On to other sculpting and I will be converting the shotgun vets individually to try and keep the motivation going... and I will be starting with the lasgunners rather than the special troopers. 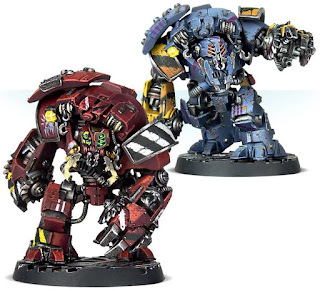 They are Ambots from Games Workshop and I plan to use them as Space Marine Centurions... or (in my army) Hearthguard Assault frames... so I may have pre-ordered three boxes of two. 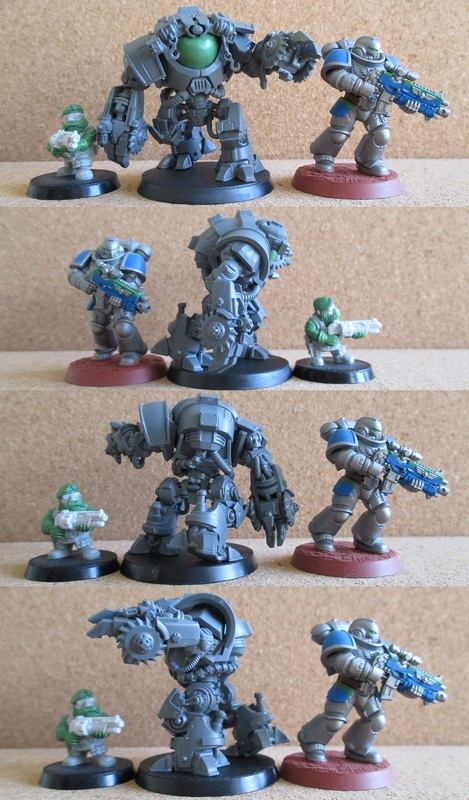 I will need to convert them but I will have to wait until they arrive before I set my ideas in stone... but the weapons they come with, match the Centurion weapon load-out very well. I can't wait to get hold of them. See you from the trawler!